Sailors and anyone interested in yachting, boating or sailing will appreciate this business card ship in a bottle made from 20 business cards. 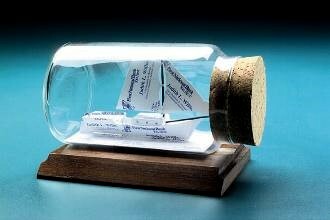 Travel agents, vacation planners and charter companies have ordered our Sailboat in a bottle sculptures. Before you decide, you may want to see our other ships in a bottle, unique boating gift sculptures made out of business cards, including Clipper Ship, Cruise Ship, Pirate Ship or Yacht sculpture.